How to Reset All Changes in a Slide in Microsoft PowerPoint 2013? Microsoft PowerPoint 2013 provides lots of text formatting options which allows the end users to quickly customize the slides which are part of the presentation. What about making so many changes and then found that it doesn’t suit your requirement? How do one revert back to the original formatting? 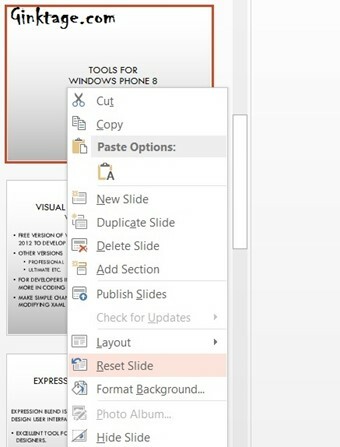 Microsoft PowerPoint 2013 provides an easy option to reset all changes in a slide to default formatting. To reset all changes in a slide in Microsoft PowerPoint 2013, follow the below steps. 1. Open the presentation file in Microsoft PowerPoint 2013. 2. In the Thumbnails view, Right click on the slide and click “Reset Slide” in the context menu. 3. Immediately, you should see the slide reset or restored to the default formatting.